Including two identical necklaces, one for adults and one for children, the Mama et Moi Pearl Bridal Pendant Set would make a delightful wedding day or Mother’s Day gift for the two most important women in your life. 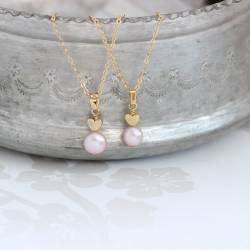 Expertly handcrafted in rose gold plate, these stunning necklaces both feature a single white freshwater pearl suspended from a heart shaped pendant to celebrate the love shared between mother and daughter. Classic link chains (available in three lengths) ensure the perfect fit, while simple clasp fasteners allow quick and easy dressing. A very special wedding gift set for grandmothers, mothers, daughters, sisters and nieces, it will delight every member of you family. The price is for one adults and one childs necklace. Further necklaces can be purchased though the product pages for the adults or mini pearl pendants. These can be found under the assessories tab. 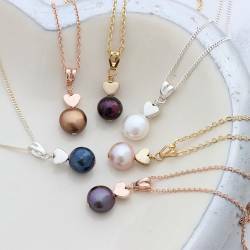 Your pearl wedding necklaces will be beautifully gift wrapped in signature Bish Bosh Becca glossy white boxes, tied with white organza ribbon edged in satin and a gold foil gift card enclosed, making this an ideal gift. The message on the gift card says "there is no remedy for love but to love some more"